Conferences are quite common among business establishments, whether it is a big corporation or a small enterprise. These events provide an opportunity for the members and staff to discuss some important matters. 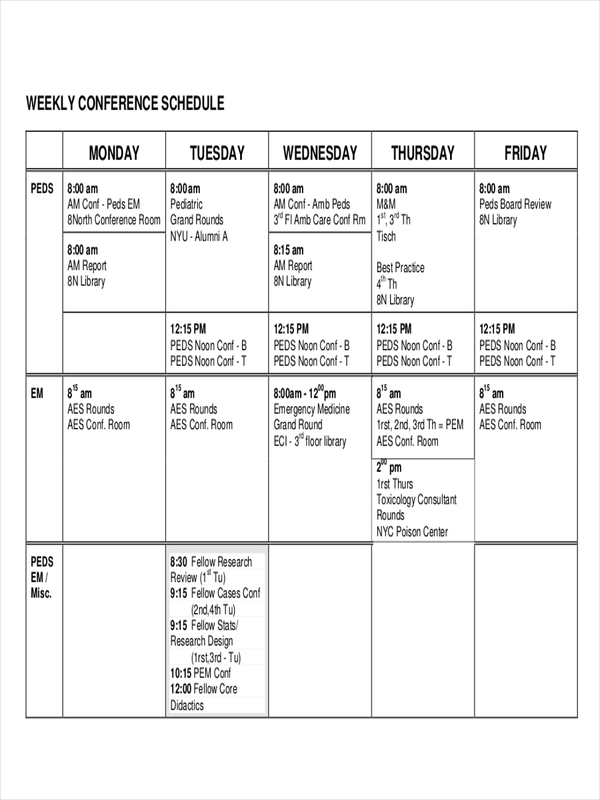 However, one cannot have a successful conference without setting up a schedule. Plus, it has to be a flexible activity schedule to accommodate everyone. 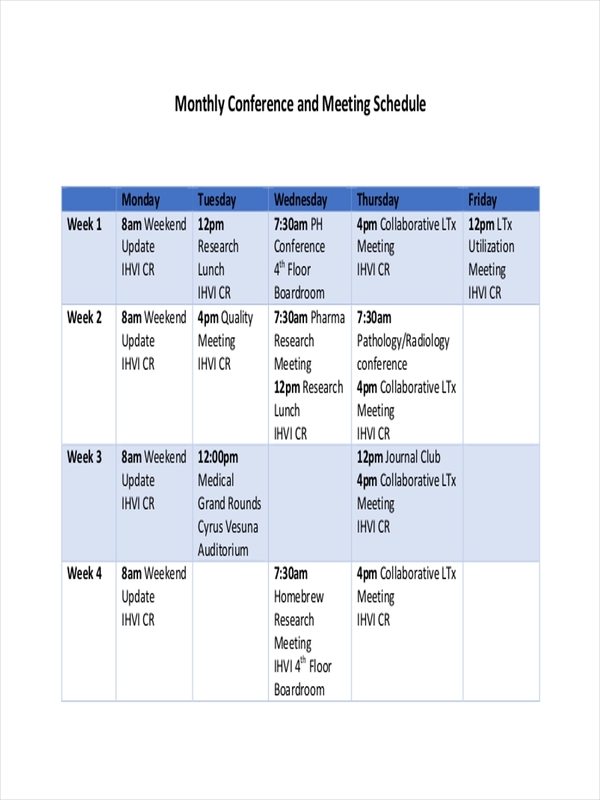 Preparing a conference schedule is almost the same as writing a work schedule. It has to be done methodically and with consideration of time. Every talks and special presentations within the conference has to be coordinated and properly planned out to provide a proper flow of events. 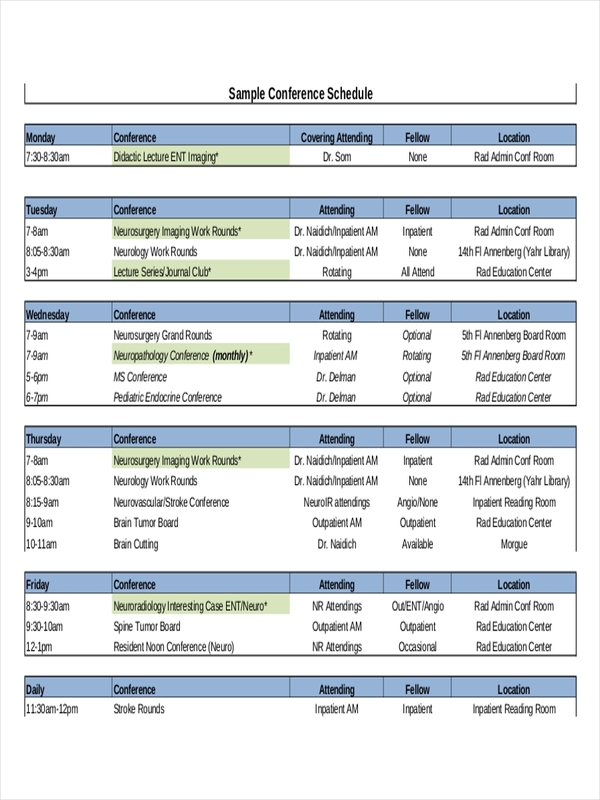 What Is a Conference Schedule? 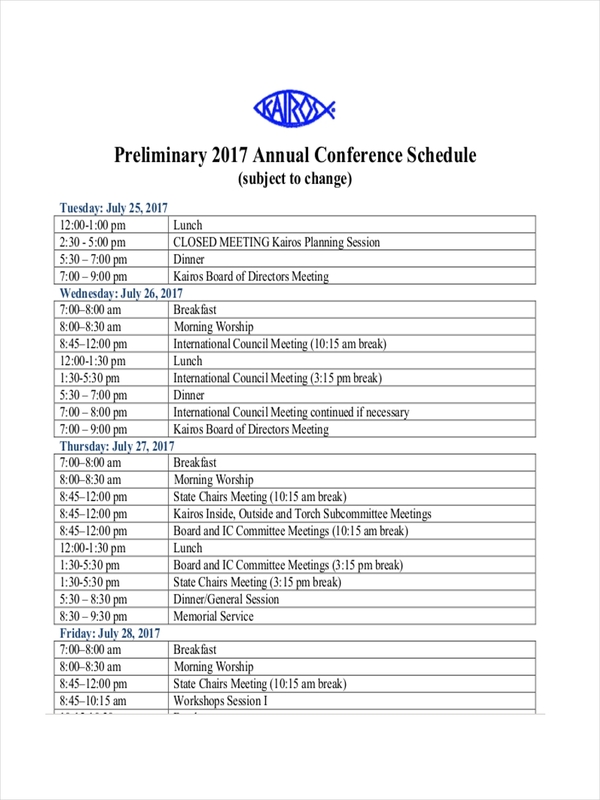 A conference schedule is a written document with a list of the things to be done or the topics to be discussed in a convention or a meeting. Just like other examples of schedules (school schedule and training schedulee), it is commonly presented in a form of a graph with dates and times. An important note to consider in a conference schedule is that it serves a big statement of purpose. It provides a comprehensive guide in order for a conference to go smoothly and end on time as planned. To make a conference schedule, you need to be familiar with how a program is drafted and created. 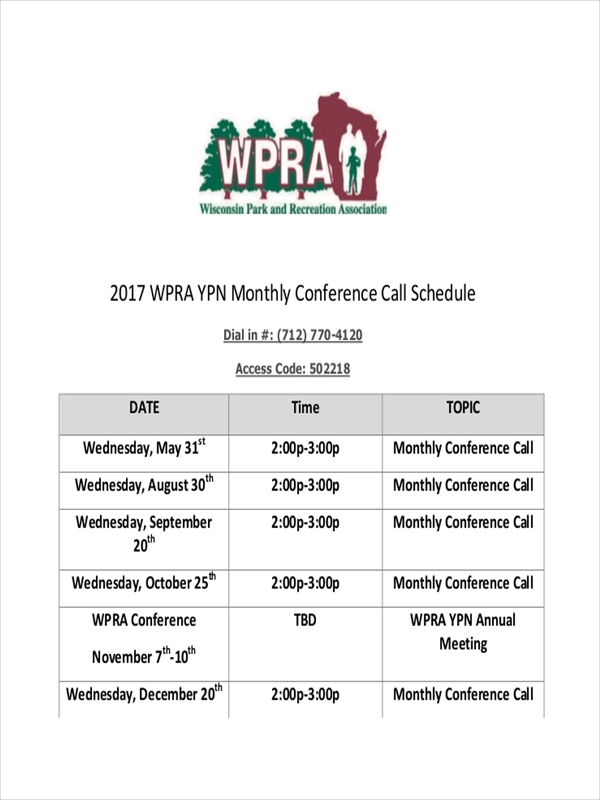 Unlike monthly schedule and weekly schedules, conference schedules are usually set by time because they don’t normally last for days. Create an outline. Design a layout on how your calendar should look like. Make sure that you will be able to present the topics or activities in a way that everyone who reads it can easily understand. Do a consultation. There is probably a conference organizer or anyone tasked to facilitate it. Consult them with the things that will happen on the event. Review and revise. Once you have drafted the schedule, take time to review it for any typographical errors or incorrect details. 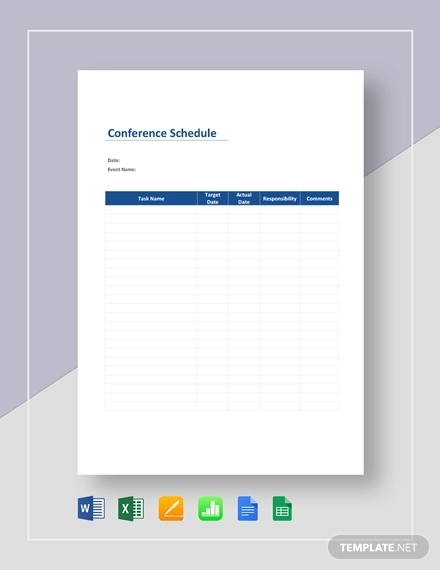 A conference schedule can be used in a variety of ways. The first and probably the major use of it is to properly facilitate a conference. 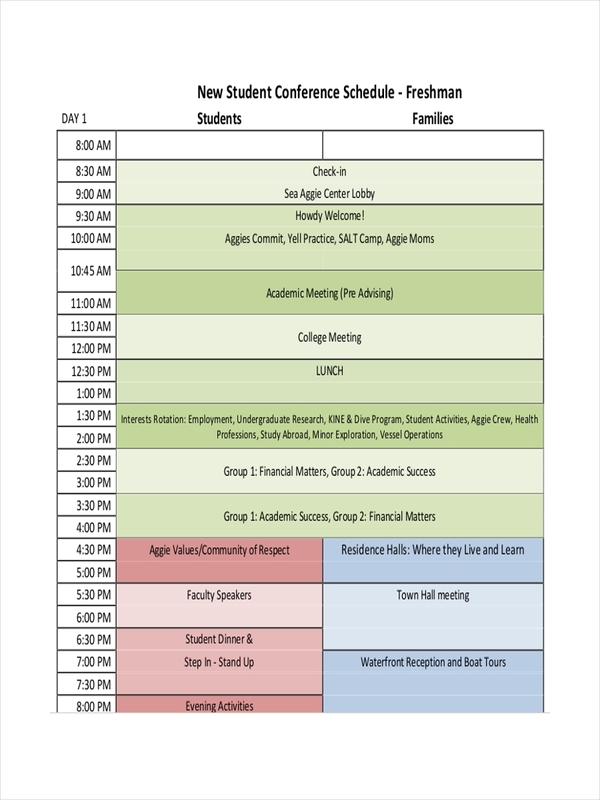 Without a schedule example in pdf, there is no proper coordination and the whole event will be in total chaos. The second most important use of it is dissemination of information. 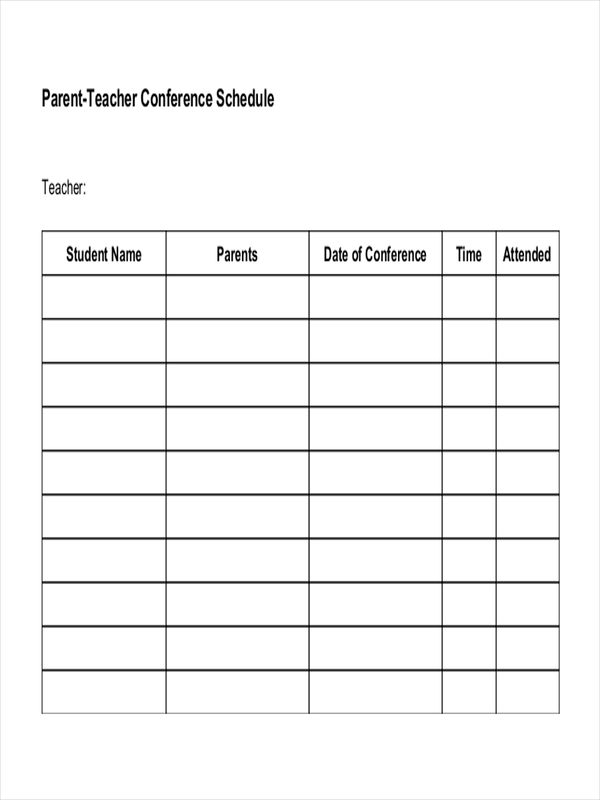 Once a conference schedule is made, it should be distributed to the attendees to provide them an idea of the activities during the conference. 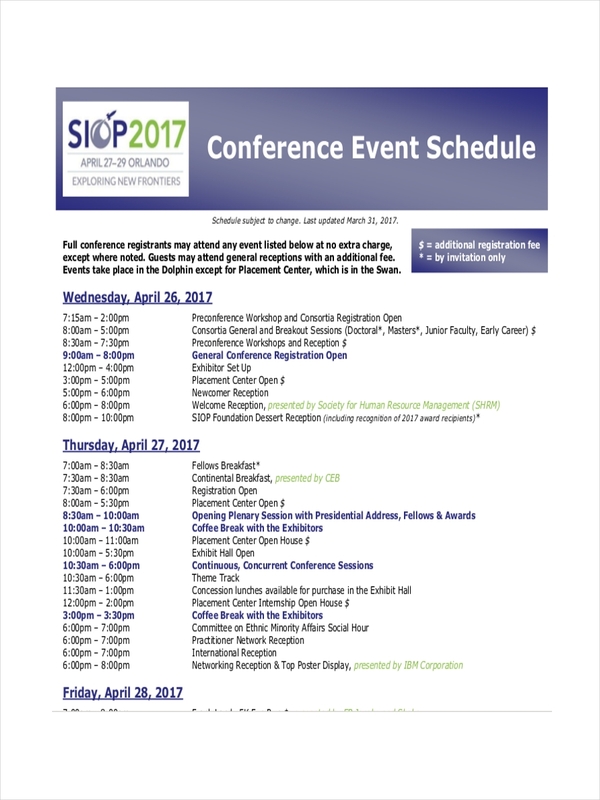 And lastly, with a conference schedule, any person who is tasked to give a talk or lead an activity will be able to make preparations. When you are making a conference schedule, you need to remember that you are not just writing any kind of paper work. There are certain things that you need to remember. Be professional. You need to observe proper language and even the font of the text. A conference is designed to be informative so be prim and proper. Make a decent preparation. 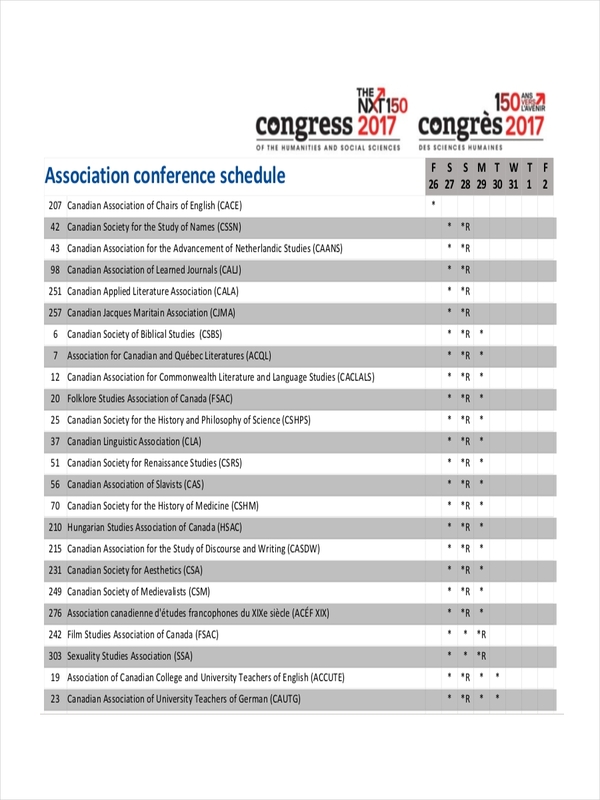 Schedules are to be made way ahead of the conference. Make sure that before the event starts, it should already be known and available to everyone. Observe proper timeline. 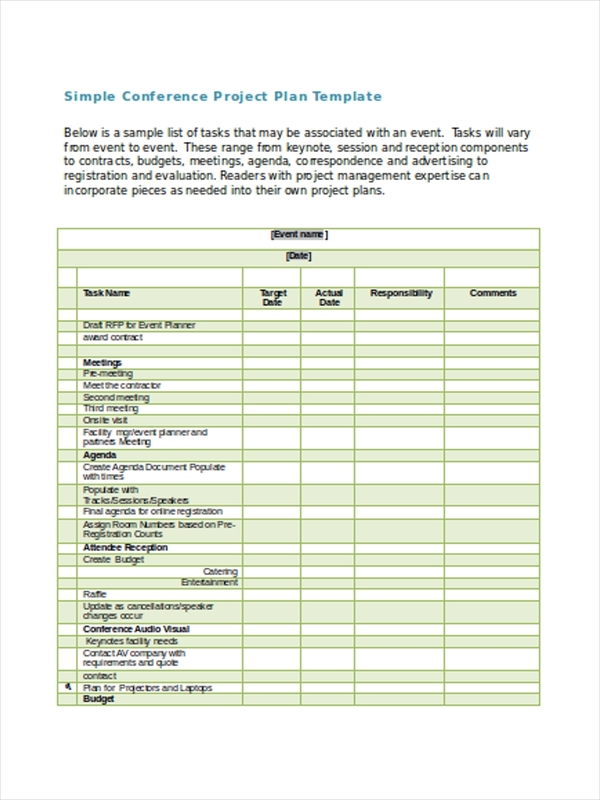 When you make a sample schedule, make sure that one activity or topic does not overlap another. Give proper time for each of them.